"Is it mad to pray for better hallucinations?" 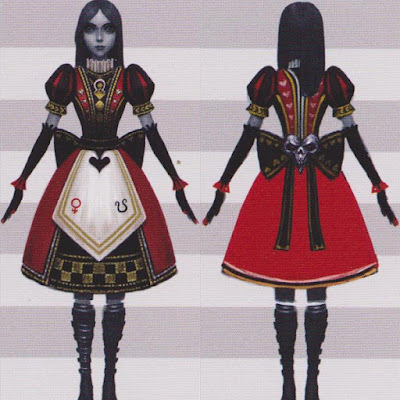 I have been wanting to making Alice's Royal Suit from "Alice: Madness Returns" for the longest time. Probably since the game came out. 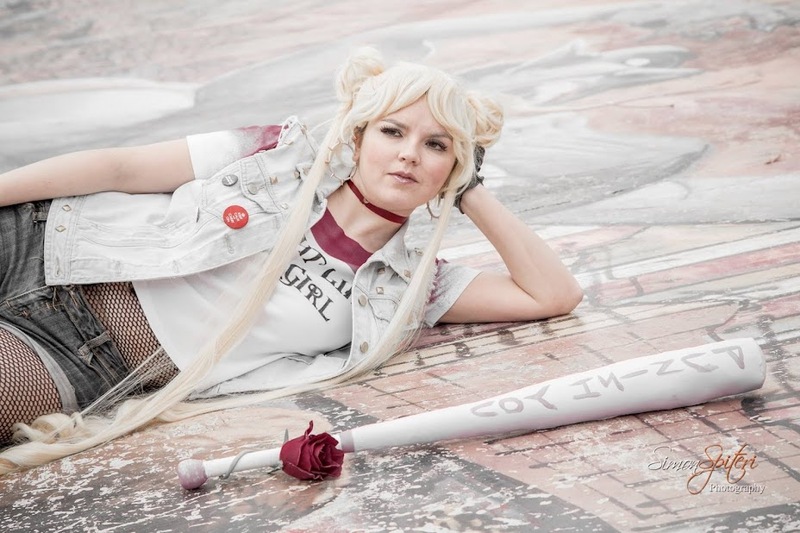 But I never felt confident enough to make this costume until now. 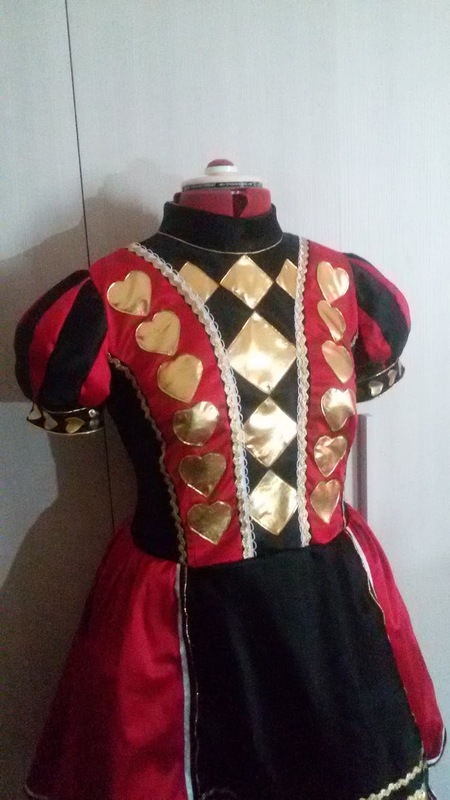 This is partly due to the amount of detail involved, but also because for the longest time I couldn't figure out how to make the bodice. 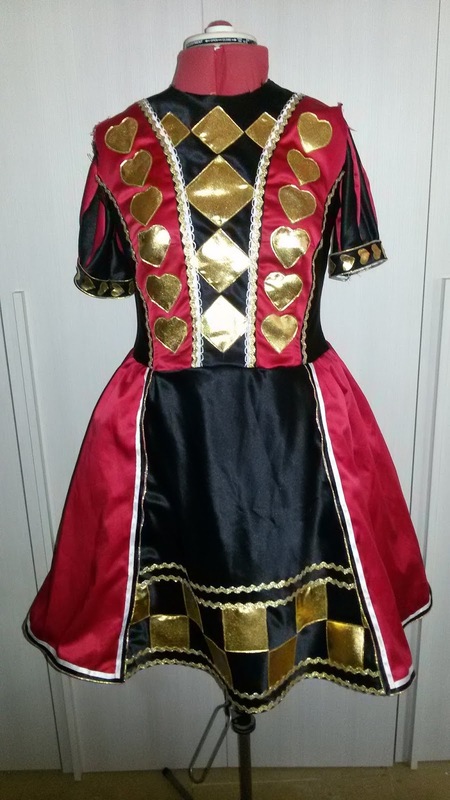 I also found some second-hand satin dresses that seemed perfect to reuse as materials for this costume. 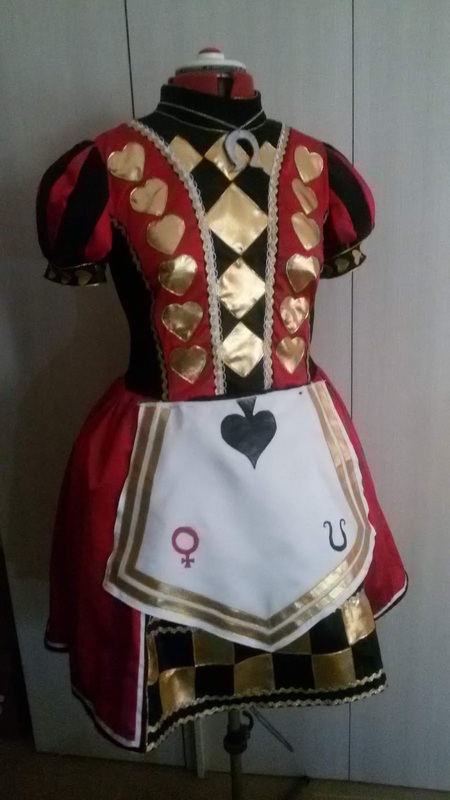 I finally got the urge to make this costume a few weeks ago. 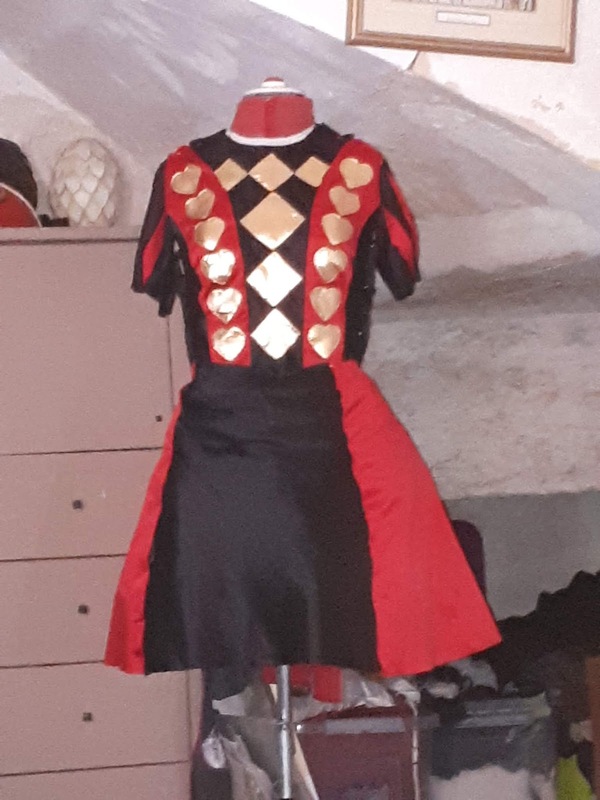 I managed to finish the dress, and start making the apron. The mockup (which is also the lining) is made from a poly-cotton pillowcase. 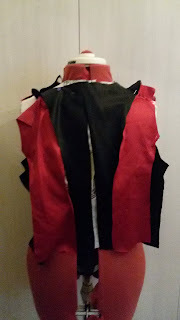 I used a basic bodice pattern from Burda, then drew on the seam lines for the black and red pieces. 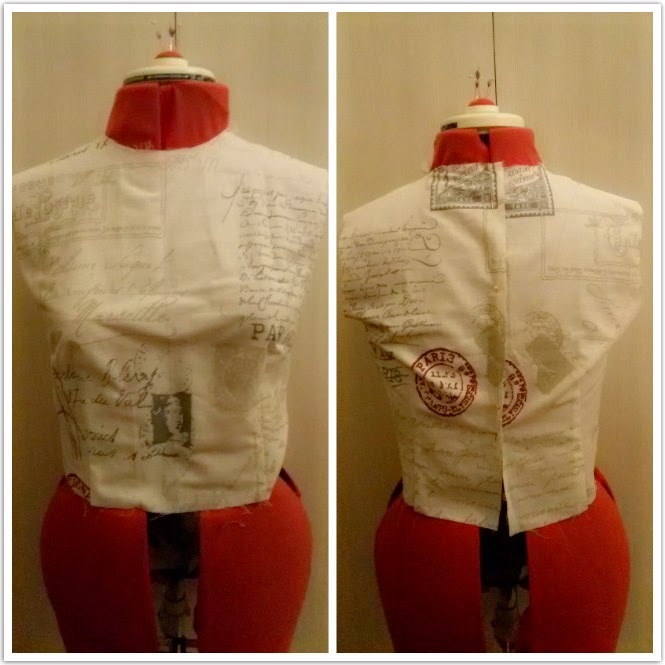 I transferred these lines to paper and made pattern pieces. I cut out the red and black pieces. 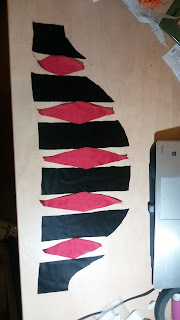 Unfortunatley I didn't have quite enough red material, so I piece some of the sections of the bodice. 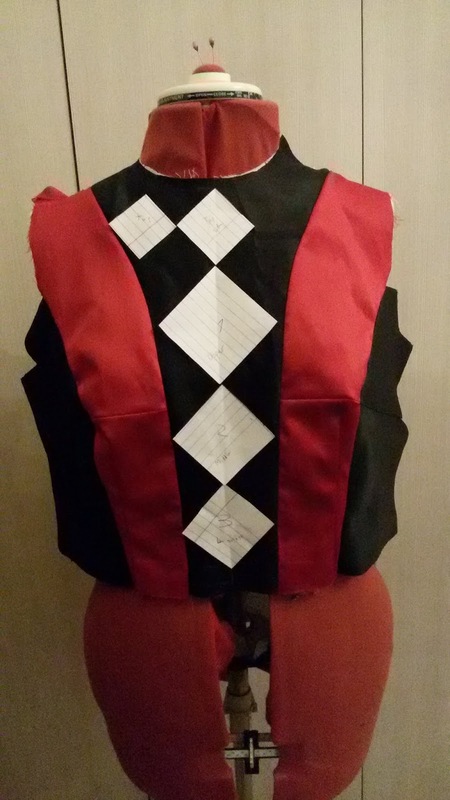 I stitched the red and black pieces together to form the basic bodice. Once the bodice pieces were sewn together, I started planning the applique. This involved maths and placing bits of paper around until they looked good, so I'm not going to go into much detail about it. The appliques are made from interfacing spandex. 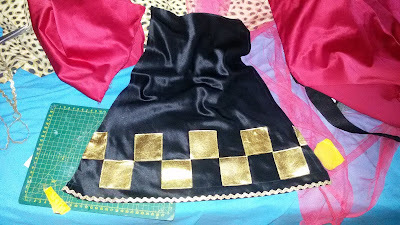 I had a lot of gold spandex for a costume that I never ended up making, so I iron the interfacing on to it, and cut out the appliques. I used fabric glue to attach them initially, then I stitched them on by machine. 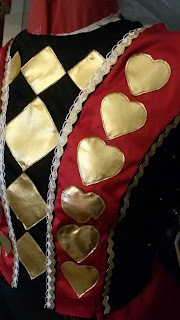 When the gold appliques were sewn on, I started adding trim. This costume requires a lot of trim. This is gold trim almost everywhere, and a surprising amount of white trim on the bodice too. I used a white loop trim and a gold ric rac. 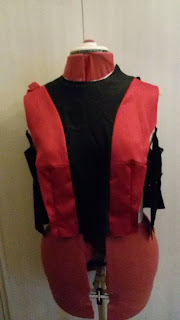 The bodice took up a huge amount of trim; I actually had to buy more white trim because I was 20cm short! 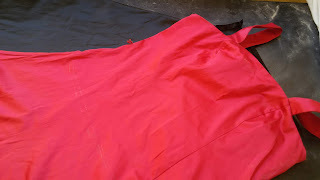 To make the skirt portion of the dress, I was lucky with the red dress that I'd bought. The skirt had enough volume that I was happy to use it for the Royal Suit. I added a panel of black fabric to it to get the correct colour. The black panel is copies from a red panel that I had cut off the skirt before. 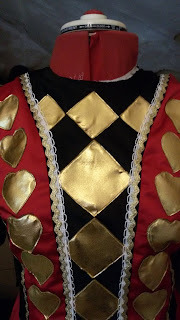 The gold appliques are also gold spandex. 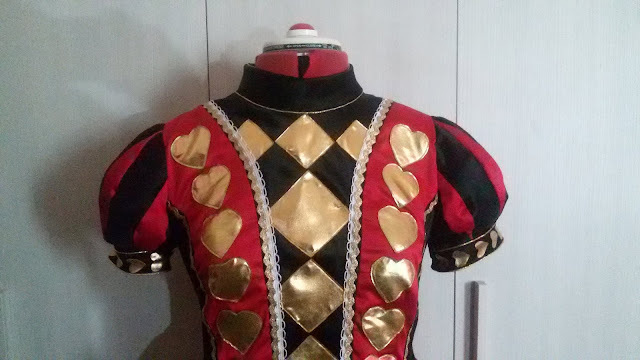 I used gold ric rac to form the stripes. 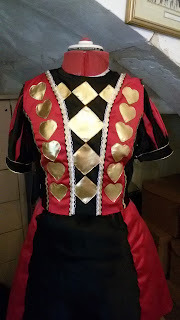 I also added trim to the skirt. 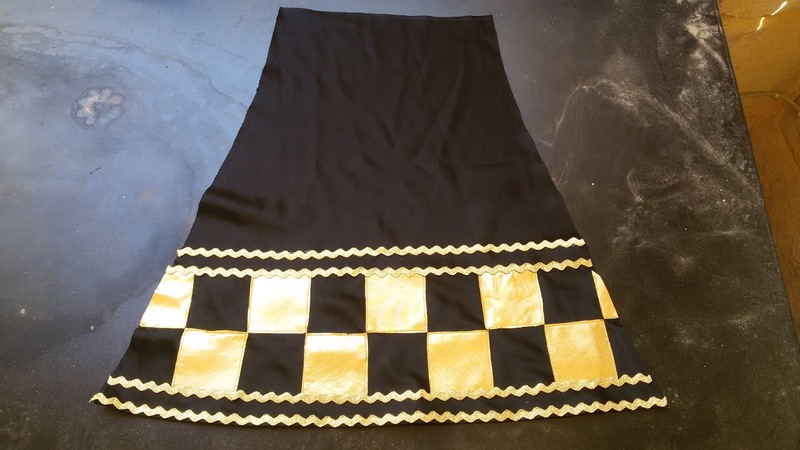 The trim is made from gold piping, white ribbon, and black ribbon. 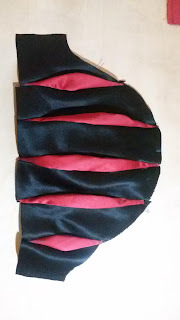 This trim was really annoying to sew on, especially the piping, and involved a lot of pins and fabric glue. The good thing about this trim is that it makes the hem of the dress stiff and gives it a nice shape. 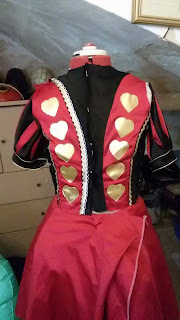 Then it was time to sew the skirt to the bodice. I messed this up the first time because I put the gathers in the wrong place, and the front was too bulky. 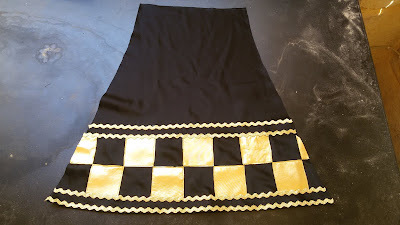 I had to unpick the stitches and regathered the skirt to make it more flattering. 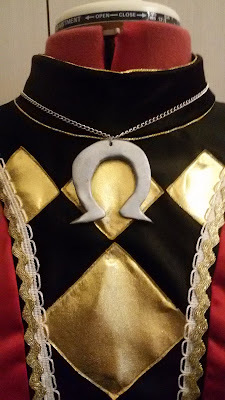 I also made a collar for the dress. The artbook shows Alice wearing a ruff, but in the game the dress has a simple collar. 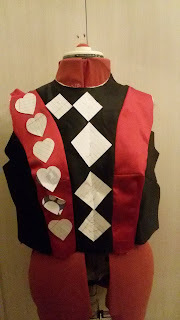 I used another pattern from Burda to make the collar. I used gold piping on the edges instead of sewing on trim, because I thought the thinner lines might look better. I also had a chance to make Alice's necklace. The Omega is made from polymer clay. 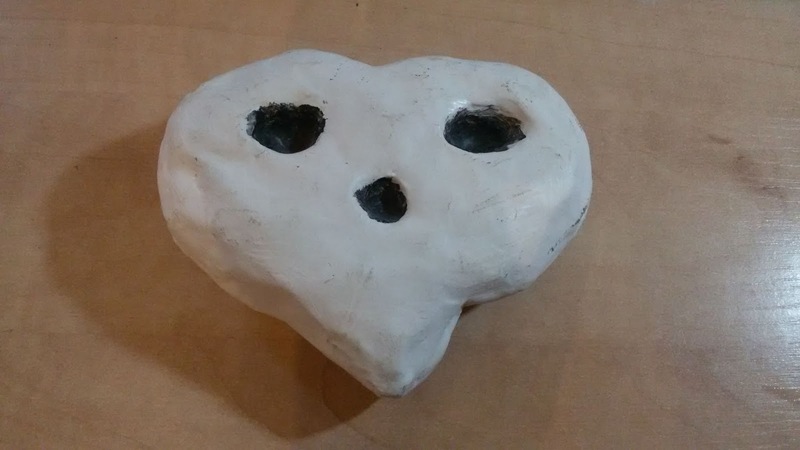 I painted the clay first with acrylic, then with spray paint. I used to jump ring to attach it to a chain necklace. I used a pattern for a slightly puffed sleeve, but instead of exactly following the tutorial. I added diamond shaped pieces. The resulting sleeve was a bit floppy, so once the bodice was lined I ended up stuffing the sleeves with tulle to add volume. The sleeve bands are just rectangles of satin with some interfacing iron on. 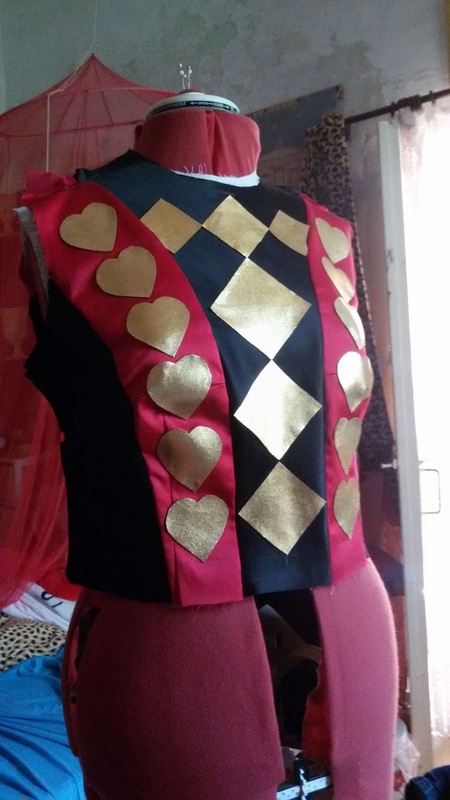 The gold hearts were cut from spandex and glued on. I did try to sew them on but they looked terrible. 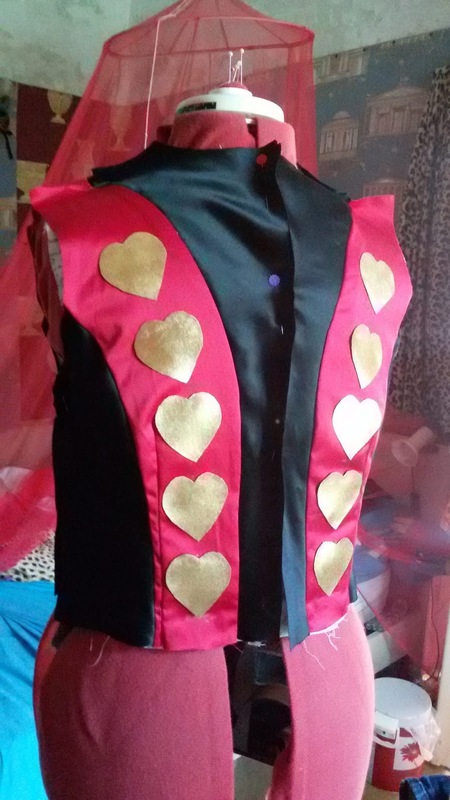 The fabric glue is not terribly secure, so I might give in and use hot glue to properly attach the hearts. The gold stripes are made from piping. I had a huge bag of gold piping from when I first started cosplay and tried (and failed) to make an Ouran blazer (we thought gold piping would look fancier). 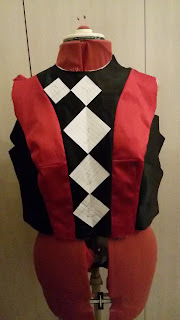 I made a lining for the bodice and sleeves. I sewed it into the dress by hand, using small stitches and trying to keep everything neat. 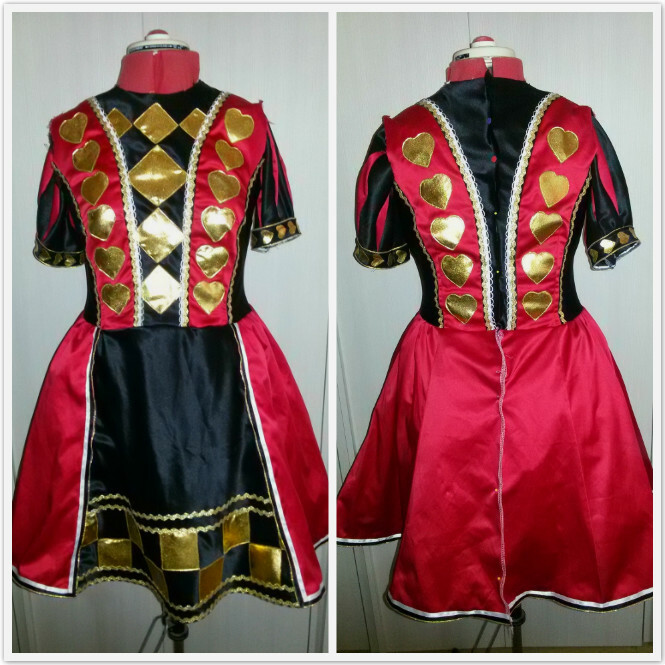 Once the zip was sewn on and the lining was ready, the dress was basically done!